Behold The Fatberg: London's 130-Ton, 'Rock-Solid' Sewer Blockage : The Two-Way Made up of cooking fat, wet wipes and other sanitary products, the mass is said to weigh as much as 11 double-decker buses. A water company official compared removing it to breaking up "concrete." The 130-ton fatberg formed underneath London's Whitechapel area and is said to be among the largest on record. Thames Water says the "rock-solid" mass is composed of cooking fat and wet wipes. There are subjects one should avoid while eating. This is one of them. Crews in London are working to unblock a section of the city's sewer system. The culprit, a stomach-churning, 130-ton mass of sanitary products and cooking fat. You might call it disgusting. Water company officials call it a fatberg. In a weekend statement, Thames Water announced the fatberg's existence. According to the private utility company, the"rock-solid" blockage had formed under the city's Whitechapel neighborhood. 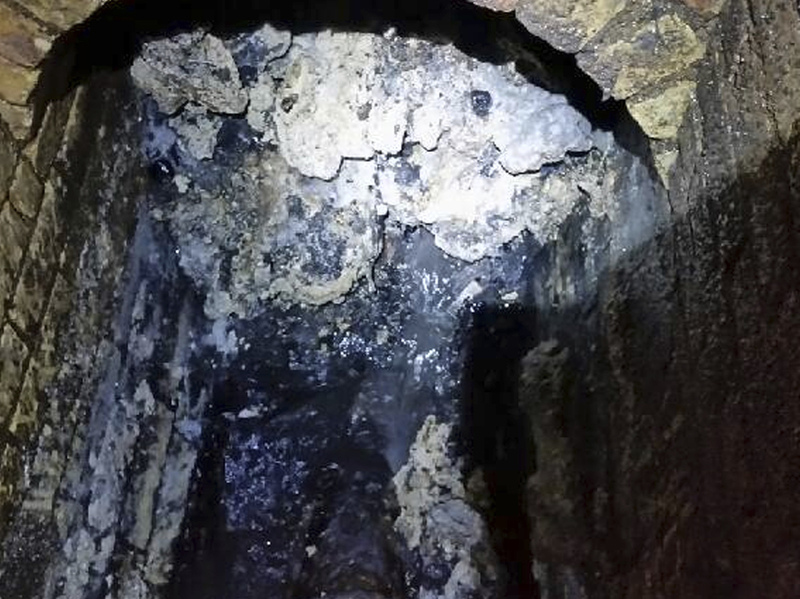 Weighing roughly the same as 11 double-decker buses, the fatberg is one of the largest to form in the London sewer system. "It's a total monster and taking a lot of manpower and machinery to remove as it's set hard," said Matt Rimmer head of waste networks for Thames Water. The Thames statement said an eight-person crew is working seven-days a week to clear the blockage, greasy chunk by chunk. Equipped with high-powered hoses, the workers are breaking up the fatberg then transporting its remnants off site for recycling. Thames Water says the team is progressing at a rate of 20-30-tons a day. Rimmer compared removing it to breaking up concrete. For context, the BBC helpfully notes that the fatberg weighs almost as much as a blue whale. In terms of length, it's twice the size of the "pitch" or field of play at London's Wembley Stadium. Blockages caused by wet wipes and cooking fat occur at a rate of roughly eight a week, and Thames Water says it spends about 1 million pounds, or just over $1.3 million, a month removing them. Of course, this isn't the first fatberg found in London. In 2013, a 15-ton mass was found in the Kingston area. It took three weeks to remove that monstrosity, which completely blocked the sewer. The Whitechapel fatberg is said to be around 10 times bigger. It's also worth noting that there is a "Bin it – don't block it" campaign to discourage flushing the types of waste that form fatbergs.